When it comes to making a difference in your community, there are no age limitations. Shea, a motivated and driven six-year-old entrepreneur, is a prime example. According to The Official Lemonade Day Blog, she began making plans for her Lemonade Day stand when she learned about others who are less privileged. Shea decided she wanted to do something to help them. Lemonade Day, held on the first Sunday in May each year in cities across America, is a fun, entrepreneurial and experiential learning program that teaches youth not only how to start their own business by operating a lemonade stand, but fundamental lessons about life, success and themselves. After explaining her ideas for a Lemonade Day stand, her family members were quick to offer their support. Her mother agreed to help her with marketing, fundraising, and other logistics, while her grandmother helped her design a logo to print onto aprons, and her father lent a hand in building the stand. While difficult to choose just one cause to support, Shea finally settled on The Twin Towers Initiative, which honors the 72 police officers killed on 9/11 and raises funds for the National Law Enforcement Museum, set to open in Washington, DC in 2013. The National Law Enforcement Officers Memorial Fund recognizes and thanks Shea and all of our loyal supporters for their dedication to America’s law enforcement officers. It is thanks to the generosity of others that the National Law Enforcement Museum is being built to honor the admirable law enforcement profession and its heroes, both fallen and living. On Monday, Memorial Fund Chairman & CEO Craig Floyd was presented with a $10,000 check by the Metropolitan Police Department of Washington, DC. The funds were raised at the 3rd Annual 2010 Race to Remember, held four months prior on Sunday, October 17, 2010. Nearly 700 runners gathered at the National Law Enforcement Officers Memorial to race around the nation’s capital, showing their support for law enforcement officers by raising awareness and funds for the Memorial. Chief Cathy Lanier thanked Memorial Fund staffers Mary Brown and Anne Kringen for their efforts in putting together the race, along with Assistant Chief Pat Burke and Officer Greg Alemian from MPD, and Marcello Muzzatti, President of the DC FOP Lodge #1. 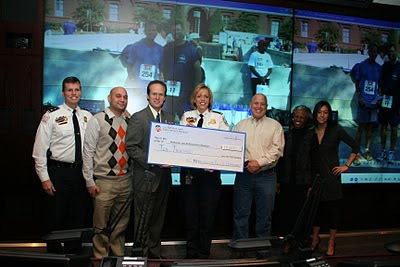 After three years, the Race to Remember has raised over $30,000 to help build the National Law Enforcement Museum. The Memorial Fund would like to thank each and every Race to Remember participant, all of our generous sponsors and supporters, the DC FOP Lodge #1, and the Metropolitan Police Department of Washington, DC for their continued efforts in honoring America’s peace officers.